This is the events listing for the coming year. Please make a note in your diaries. Full details will be posted on the webpage, Facebook and emailed 4 weeks prior to each event. We hope that you can join us during the year. 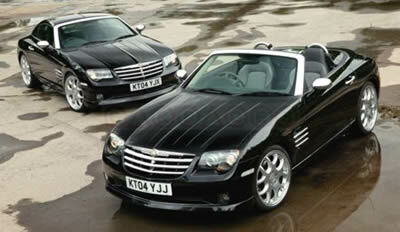 Many of you may know that during my time with the Club I have been lucky enough to be able to re-unite the two Startechs that Chrysler UK used in 2004 to promote the Crossfire and both cars have been seen in many editorials with the, now, famous aerial shot. In October 2011 Steve Walsh, the then Leader of the Club, wrote an article which is on the Club website under Owners’ stories. This is the latest on the journey of these two cars. Joining UK Crossfires is going to be the best thing you’ve ever done for your car - you’ll get to meet new people, have access to a range of membership benefits, as well as meeting new people and having fun with your car. We’ve got a great lineup of benefits that you will be able to access once you’ve joined. We’ll be able to tell you more about these very soon - final details are being put together.